Positivity is something that comes natural to some, but for others, especially those struggling with anxiety, negativity and negative thoughts can be overwhelming. Learn how we used our Secular Gratitude Journal to help create an overall positive mindset for my anxious son. The power of words is immense. They can lift you up or crush you under their weight, educate or confuse, and, most of all, control your emotions like a puppeteer. The greatest part is that those words have even more power when they come from you. Created by your own mind, your own words can alter your perception of reality. 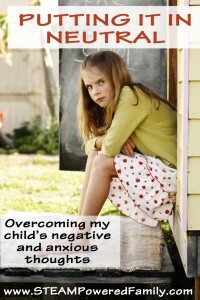 My son struggles with anxiety and with that anxiety comes these negative words that bring him down further and further. Negativity is a constant struggle for him. We use one very powerful technique that I’ve shared before, we refer to it as Putting It In Neutral. It works very well when we are in those situations that cause negativity to flood through him. 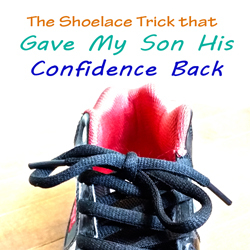 Lately though, my son’s anxiety has been not situation specific but more generalized. Especially on school days. I knew I needed to find something that would shift his thinking fundamentally so he could move into his day thinking positive thoughts. My hope was that the power of those positive words would help to ward off the negative thoughts that seem to have so much power over him. I’m sure many have heard about Gratitude Journals. They are quite popular, so I thought I would give it a try with my son. Then I ran into a brick wall. I couldn’t find a single journal that was not filled with scripture or had flowery designs that I knew my son would turn off my son immediately. Everything seemed to be designed for adult women. I needed something for my son that he would willingly use. 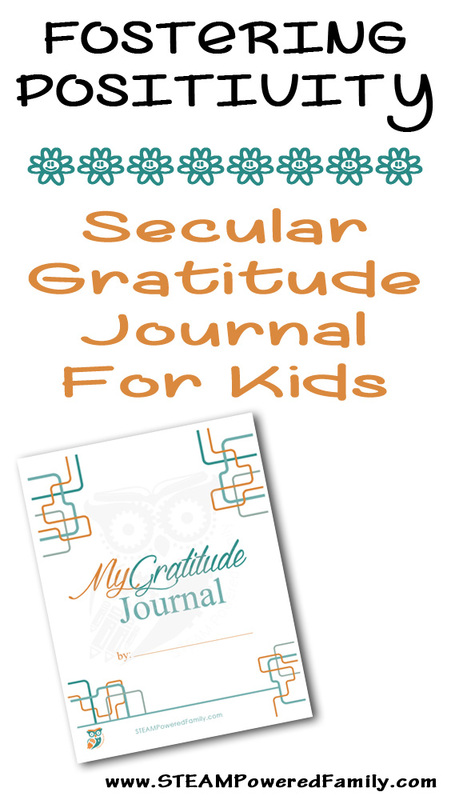 After failing miserably to find something that would appeal to him, I finally decided to just make my own secular gratitude journal with the needs of kids in mind. It’s a simple geometric design and in addition to the cover page it has five pages, each asking something different, but positive and uplifting. This helps bring the focus onto the good and positive. I went with the 5 page design so that each day of the work week we would complete one page. I decided we would take weekends off. This way it also works well for teachers to use in the classroom. And guess what? It’s working! School days have been going much smoother. The negative thoughts are lessening and the attitude toward school work has done a 180. We do one page first thing in the morning. It takes only a few moments, but writing down those few powerful words about his passions, loves, goals and happiness changes everything. My son even enjoys doing it. Why? I think because we all want to feel positive and feel good about ourselves and our lives. Bringing our awareness onto those good things makes us feel happy, and who doesn’t want to be happy? 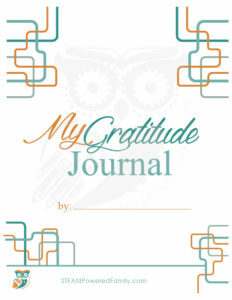 I’m offering my secular gratitude journal for FREE to my newsletter subscribers. 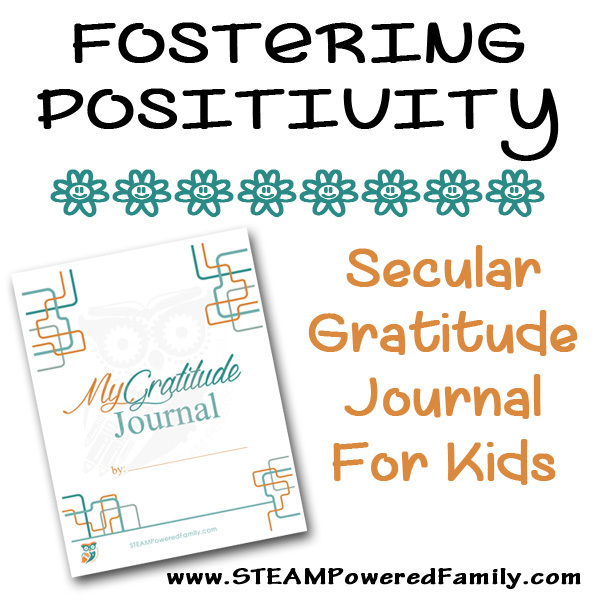 Simply join the STEAM Powered Family and enjoy free resources such as this Gratitude Journal and a checklist for building a Family Emergency Go Kit. 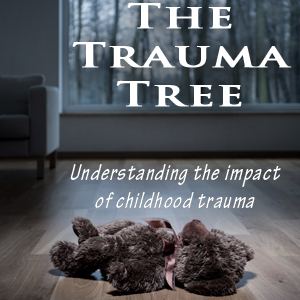 You will also get a weekly email from me updating you on the latest articles and resources featured here on STEAM Powered Family. Your email will never be shared. I hope you enjoy this Secular Gratitude Journal and find it helps bring about more positivity in your days! I don’t know much about gratitude journals but this seems super cute. Thanks so much for this! My son has just been diagnosed with Generalized Anxiety Disorder, so I’m excited to use this as a tool to help him stay positive. I hope it helps. I’m finding small steps add up over time. Hang in there! 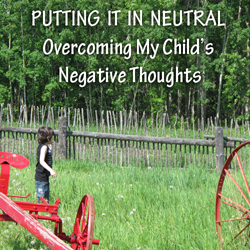 Also, you may want to read my article Putting It In Neutral, A Powerful Way to Battle Negative Thoughts. It is a technique taught to me by a psychiatrist that you might find helpful.